The humble Chesterfield sofa as we know it is steeped in history. The origins of the name ‘Chesterfield’ itself have been much debated, with some saying it was adopted from the Canadian word for sofa and others claiming that the fourth Earl of Chesterfield, Philip Stanhope, was honoured by the commissioning of a piece of furniture that is represented by Chesterfields as we know them today with level arms and back. As iconic today as it was hundreds of years ago, Chesterfield 2 seater and 3 seater sofas are widely known for the meticulous attention to detail in every design and the high quality of the materials used to create the famous piece of furniture. Throughout the decades of Chesterfield’s history, little has been changed about the design process – so when you buy a Chesterfield sofa you’re essentially buying a piece of history, without investing in an antique! 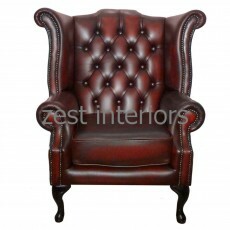 At Zest Interiors we are proud to offer a selection of Chesterfield sofas that are reminiscent of their rich history. As you’d expect, each Chesterfield 3 seater and 2 seater sofa is carefully designed and manufactured, with hand-finished details to ensure the highest standards of quality and durability. Providing a fabulous collection of Chesterfield 2 and 3 seater sofas, Chesterfield Queen Anne chairs, Club chairs and even Chesterfield sofa beds, Zest Interiors is the go-to company for authentic, high quality Chesterfield sofas that won’t break the bank. Available at half the price of Chesterfield sofas at other retailers, why would you want to go anywhere else? Take a look at our collection of genuine Chesterfield sofas online, or call into our Showroom to browse our range and try them out! 0 Comments To "The History of Chesterfield Sofas"